This plug-in uses unique technology for stereo enhancement. Unlike traditional techniques that can introduce phasing and inversion effects. 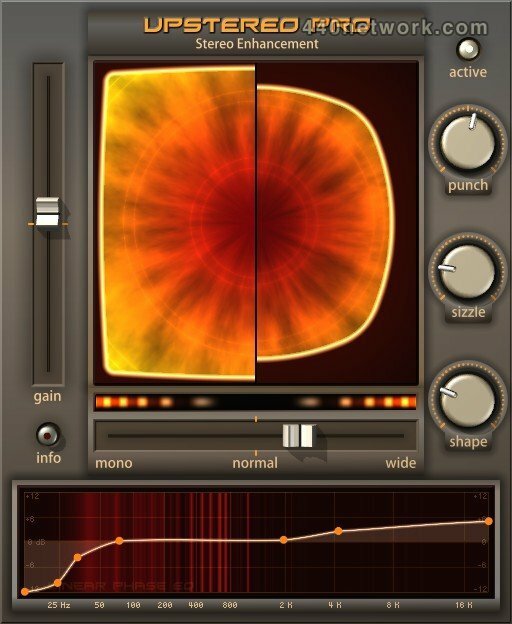 UpStereo Pro uses spectral processing and is engineered to shift actual pan locations of sound around the stereo field. The punch and sizzle parameters finely control the transient attack and intensity of bass and top end. The equaliser fine tunes your mix with easy to control spline editing, and uses linear processing to ensure the sharpest and cleanest results. The shape control replaces the 'Loud' button of the old UpStereo with smooth adjustments from subtle to exteme and distorted. 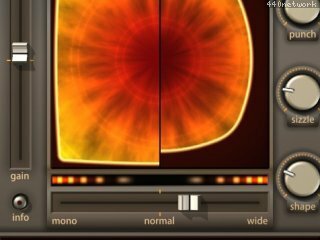 - Stretches stereo width without using traditional phase techniques. - Unique technology that stretches sound locations toward the stereo extremes, keeping central sounds intact. - Punch control for enhancing or dampening initial bass or kick sounds. - Sizzle parameter for giving high end transients a fizz and sparkle. - Linear equaliser with 16 point spline editing. - Waveshaper with extreme settings. - On screen information panels for each of the controls. - 64 & 32 bit versions in VST and AU formats. * Features a new core engine, with better quality and half the latency. * Increases stereo edge sounds without slurring transients. * New visual indicators for bass and harsh top end. * New overall linear EQ gain for making either very subtle or massive changes.